Picking a bracket for March Madness is possibly the most difficult thing you will do all year. There are so many competing interests, strategies, predictions, and duties that your bracket never ends up the way you want it to be. To combat this, I make about 12 a year. But I'm not going to bore you with all of them. Instead, I'll tell you about my strategies for each, then explain the theories and choices behind the bracket I made with most confidence. This is the most obvious and easiest bracket to choose. Pick each game based purely on who you want to win, nothing more. Of course, this strategy is never fully employed. For example, I hate Florida basketball with a passion, but there is no way I am picking them to lose in the Round of 64. Obviously, as a current student, Syracuse is my choice to win in this strategy. Slightly better, but barely, than the first option is the system that requires you to glance, briefly, at each game and pick the team that your all-knowing subconscious wants you to pick. The axiom "go with your gut" is your personal tagline for this bracket. 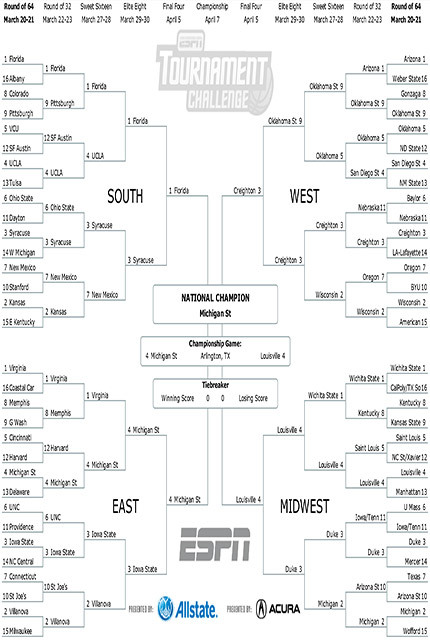 My version ended up with another personal favorite, UCLA, winning it all, but also a lot of teams I dislike making runs because I do think they will win. Fairly self-explanatory, the favorites strategy works by simply picking all favorites. Again, this strategy also never works because I inevitably end up with a few upsets that I (for absolutely no real reason) feel really confident about. This is a new one for me. This year, the bracket makes absolutely no sense. Wichita State a one-seed? Kentucky a nine? In the scope of college basketball history, this is blasphemy. Additionally, it seems that every year, a couple of low seeds make a run, but in the end, a traditional power, or blue blood, ends up winning. With that in mind, I chose every game based on which team is traditionally better than its opponent. So, Kentucky beats Wichita State in the Round of 32, and Arizona ends up winning the tournament. I also took into account talent of this year's teams, which, again, ruins the strategy entirely. So, you've done your hours and hours of research, and you know that you just can't be right. Instead of putting down your well-researched, logical selections, you merely pick against every strong feeling you have. Hedging your bets, in other words. My personal favorite. I spent far too much time since Sunday researching each first round game, then each following game that results from the first pick I made. This truly is the bracketologist's best shot. If Joe Lunardi and Nate Silver can do it with numbers, why can't I? This truly is the bracket I think has the greatest chance to win. But again, what do I know? There are a couple first round upsets I feel very strongly about. Primarily, Stephen F. Austin over VCU in the South Region. SFA has won 28 consecutive games and plays a very aggressive, turnover-inducing defense that is 26th nationally in points allowed. VCU plays a similar defense, employing their trademark "Havoc" full-court pressure. However, VCU doesn't have much experience playing against a defense like this and are in the bottom half of the country already in turnovers. Don't expect the Lumberjacks to get any further, however. Additionally, I am confident in my pick of Harvard upsetting Cincinnati. This is deep, veteran Harvard team with a lot of tournament experience going up against a slightly over-seeded Cincinnati. This should be a fun, competitive game that I expect the Crimson to win. Moving past the second round finds what is probably my most jarring pick: Oklahoma State over one-seed Arizona. The Wildcats are a tough team to pick because they are atop the easiest region, but also face the toughest nine-seed in any region, the Cowboys. If Arizona can pass that test, I think they make the Final Four. However, I think Marcus Smart is out to prove he's still a star, eventually leading his team into the Elite 8. Now, to the Final Four. I am a huge fan of both Louisville and Michigan State, both playing with chips on their shoulders as underrated four-seeds. The Cardinals have both experience and star power in Russ Smith, and I think stars win games in the tournament. But complete teams win championships, and a finally healthy Michigan State is just that. The Spartans are healthy for the first time since November, well coached, and experienced. Additionally, my bracket has Sparty taking a relatively easy road to the Final Four, having to beat only two single-seed teams before Florida. Tom Izzo will have them ready, and Louisville will not be able to repeat. Call me crazy, call me brilliant; just make sure to remember I'm just like you-taking random, overly-educated guesses at an event we love and cherish for its shock value. What is March without a George Mason in the Final Four? It's just another month, and that's no fun. Which is precisely why I'm rooting for myself to be wrong. And for you to be wrong, and everyone else around you, too. That's what makes it Madness.